In this thorough and engaging workshop, Sheri Van Dijk breaks new ground by adapting DBT for people living with bipolar disorder, depression, anxiety disorders and other problems in managing emotions. You will be able to help your clients find order and peace in their lives again, and to make changes that are long-lasting! In this thorough and engaging workshop, Sheri Van Dijk breaks new ground by adapting DBT for people living with bipolar disorder, depression, anxiety disorders and other problems in managing emotions. This workshop provides clinicians with real-life day-to-day tools you will be able to teach to clients struggling with mental health issues and other emotional and relational problems. You will be able to help your clients find order and peace in their lives again, and to make changes that are long-lasting! DBT is a treatment originally designed to treat clients with BPD, but is increasingly being used to help clients with general problems in regulating emotions. Whether related to a mental illness such as bipolar disorder, depression or anxiety; or just to difficulties managing emotions that lead to problems with anger, relationships, and low self-esteem, an inability to manage emotions can lead to chaos and misery. 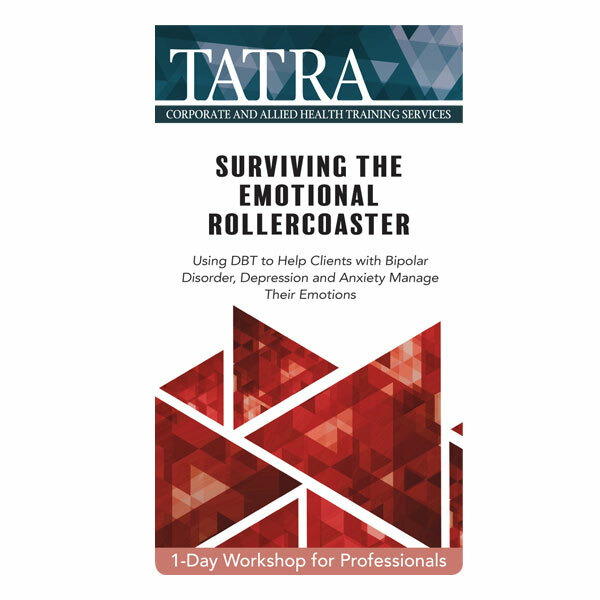 This workshop delves more deeply into the DBT skills – broadening your understanding of some of the most important skills to help clients manage emotions and your ability to teach these to clients. The focus will be on providing you with the strategies and the tools you can use the very next day in your work with your clients. You will learn how you can assist your clients to integrate their current coping skills with new and effective DBT skills and techniques for living well with bipolar disorder, depression, or anxiety disorders, as well as with other problems such as managing anger, chronic shame, and low self-esteem. The four DBT skills modules – mindfulness, distress tolerance, emotion regulation, and interpersonal effectiveness – will help your clients manage the emotional ups and downs and minimize the frequency and intensity of depressive and manic episodes or anxiety attacks. By using these techniques in conjunction with medication and professional care, your clients will soon experience relief from symptoms and come to enjoy the calm and confident feeling of being more in control.